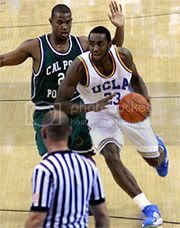 UCLA Head Coach Ben Howland announced at his weekly press conference that forward Luc Richard Mbah a Moute had started practicing again yesterday and should be ready to play this week against both Arizona schools. Mbah a Moute missed both road games in Oregon as a result of suffering a concussion during the USC game over a week ago. "Luc had a CT done yesterday for precautionary reasons, and it was negative," Howland said. "He worked out for an hour yesterday and he felt fine afterwards so hopefully he'll have another good result today." Howland also said center Lorenzo Mata-Real, who played on Saturday against Oregon State, was fine. The school administration and athletic department at Oregon formally apologized to UCLA for the behavior of their crowd towards Kevin Love and his family during the game on Thursday. The Duck's athletic director attempted to call Howland personally. "It was nice of him to apologize," Howland said. "He called me yesterday but I wasn't in. Its all behind us now. They are a first class university and they handled it." Reserve forward Nikola Dragovic has played a key role in each of the last two games for the Bruins, giving the team a much needed lift off the bench. "He made a big shot against Oregon and played solid defensively," Howland said. "He gave us good minutes. You could tell from his practices in the last week that he was playing better. We need that from him." Howland heaped further praise on his freshman center Kevin Love who was voted Pac-10 Player of the Week for the third time this season. "He's the best rebounder I've ever coached," Howland said. Good news on the returns. The Arizona's will be a tough set of games. Probably the most difficult 1-2 punch in the Pac-10 series-wise. Az St. should be fired up after losing a couple and AZ is playing much better ball lately. Personally, I always look most forward to the AZ vs. UCLA match-ups. Historically, these games are usually close - more of a rivarly here than with u$c. GO BRUINS!